His full name, says Gazzetta, is almost as long as the list of trophies he accumulated during his career. But hopefully for Inter, Nuno Ricardo de Oliveira Ribeiro “MANICHE” has thirst to add many more to his curriculum. The recent transfer from Atletico Madrid felt quite relaxed at his Milan press conference this week, and is very eager to begin his contribution towards the Nerazzurri’s chase for the UEFA Champions League. “To win“, Maniche said, “we must be a family, a united group. It will be difficult because there are many strong teams out there, but Inter has all the necessary qualities in order to achieve this objective“. Maniche is the 3rd player on Inter’s roster (after Luís Figo and Santiago Solari), to have already won the “Cup with the Big Ears” with another club (FC Porto). An experience which the Inter board and manager Roberto Mancini will undoubtedly be counting on. 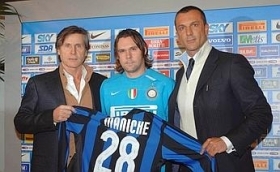 “The first impression I got arriving at Inter was very positive” said Maniche. “There is an incredible organization, everyone knows what to do, and it’s very important because a player can then focus strictly on playing“. There is no doubt that Maniche will find a much calmer atmosphere here, at the Pinetina training ground, compared to that of Vicente Calderón stadium (the relationship with Atletico Madrid coach Javier Aguirre had reached breaking point this past month). However, Maniche made a point in specifying some things about his ‘difficult character’: “Some have said I’m not very easy to live with. But having a strong opinionated mind doesn’t necessary mean being ‘difficult’. One must have respect for his own profession and be sincere. 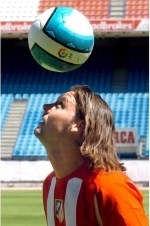 In any case I’m not thinking about my Atletico Madrid experience anymore, that’s in the past“. If all goes according to plan for Inter, Roberto Mancini could utilize his new Portuguese recruit as early as Thursday afternoon, for the Coppa Italia match against Reggina (which should also feature, hear hear, Filippo Mancini a.k.a. Roberto’s son, age 17). In any case, we should definitely see Maniche in the starting line-up against Parma this Serie A week-end. A welcome addition for the Inter coach who’s been dealing with many injuries in midfield this season. “In my career I almost always played as a regular player, but this is Inter, there’s much competition for a spot in the starting 11. However I am convinced that I’ll do well“. 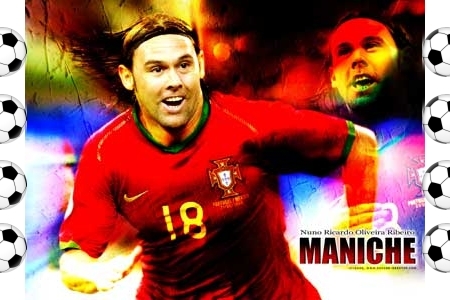 The Portuguese star added: “I am a team player, not an individualist. It will not be easy but I will work hard to be always ready. One thing’s for sure, I didn’t come to Milan on holiday“. Maniche (who will be wearing nº28, because his favorite nº18 is already taken by Hernan Crespo) has 5 months to convince the Inter bosses (the duration of the Atletico Madrid loan). “I have spoken a lot to Luís [Figo]” said Maniche, “and he told me there’s a great atmosphere, people who are used to winning so I will not have any adaptation problems. 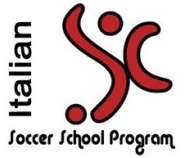 I know the Serie A is physically very demanding, but I am sure I’ll be staying much longer than a few months“. For Inter’s sake, we can only hope so too. Maniche’s name on his identity card is in reality Nuno Ricardo de Oliveira Ribeiro. The nickname “Maniche”, which through the past years has become the tag name by which everyone identifies the 30-year old Portuguese international, actually originally belongs to Danish striker Michael Manniche, born in Copenhagen on July 17, 1959. Danish Manniche played for 5 seasons (1982-87) in the Portuguese club Benfica, for which he played 132 games and scored 75 goals in the Portugal SuperLiga. At the time, a 7-year old boy named Nuno (our “current” Maniche) fell in love with the playing style of the tall blonde Dane, and eventually chose Manniche’s name as his own (or almost that is… he removed an “N”). This entry was posted on Wednesday, January 16th, 2008 at 4:43 pm	and is filed under Inter, Player Profiles, Transfer News & Rumours. You can follow any responses to this entry through the RSS 2.0 feed. Both comments and pings are currently closed.